As we age, safety becomes a priority, as it can sometimes come down to a matter of life or death. The outside world presents its own set of challenges, but a senior citizens’ own home can be dangerous as well. Stairs, floors, rugs, hard to reach items on high shelving, and bathrooms all seem innocuous and are taken for granted by the young and healthy. However, for the elderly or infirm, regular everyday places or activities can have consequences. Leading causes of falls include impaired vision, weakening of the lower body and muscles, foot pain, and use of medication that can impair judgement or cause balance issues. Falls can be prevented, when those vulnerable are in a position to be proactive about their health and safety. Visiting a physician for regular checkups, an optometrist for eye exams, getting a walker for seniors and performing low impact exercises that can help with balance are all things that can be helpful. Another solution is to make the home safer if a senior citizen is going to continue residing there, with or without an in – home care aide. Removing rugs and mats, fixing broken steps are a few home improvement tips. Another is improving the bathroom, as it is especially a cause for fall concerns, with high tub lips and slippery tiling. Installing grab bars in a shower or next to a toilet, non slip strips in the shower stall, brighter lighting, and putting in a walk-in tub can all improve bathroom safety. Basically, a walk in tub is a tub with a door on it. Having a door allows the user to walk into the tub rather than stepping over the edge. A costly but excellent investment, walk in tubs are still less expensive than medical bills or moving into an assisted care facility. As a big undertaking, there are certain things to take under consideration before installation. Research: Since there are numerous types of styles of tubs available, along with functionalities, its best to research what will suit the needs of the user before committing to buying one. 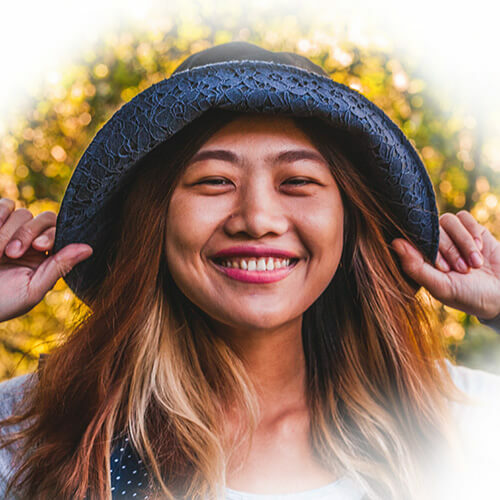 Check out reviews online from fellow consumers and with friends and family to get unbiased feedback on not only the tubs but also the manufactures. Assess: Assess the needs and wants of the user. What style of tub do you want, and will it fit not only within your budget, but in your bathroom? Budget: Set a budget to determine what you can afford in not only a tub but also its installation, and repairs if a warranty does not cover everything. In Person Perusal: If possible, visit retailers to examine tubs in person, and test out the features; make sure the door entry step can be managed, the seat is comfortable, and the user has an easy time turning the levers on and off. Water Heater Capacity: Due to their size and design, walk in tubs require at least 50 gallons of water. The size of the homes water heater may hinder the heat of the water if it is too small. An upgrade may be necessary to avoid sitting in cold water. Its best to consult a plumber. Bathroom size: A walk in tub needs to fit in the bathroom. A typical walk in measures 60 inches long. 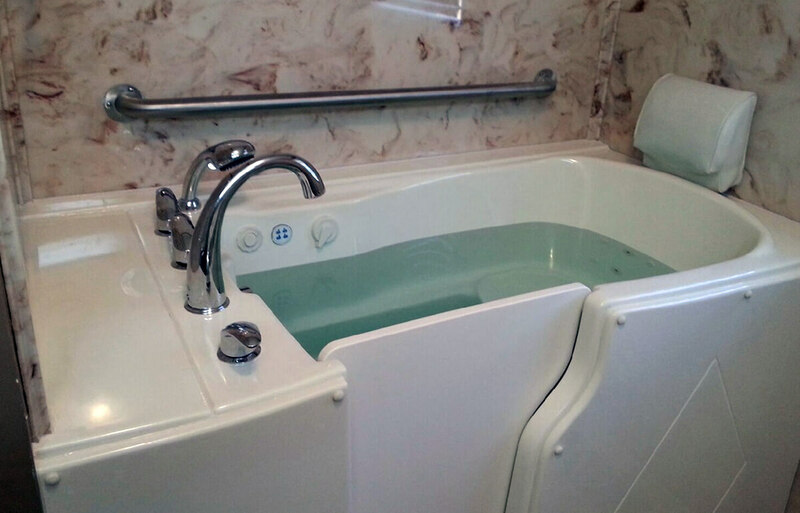 While this is the same size of a standard tub, the width of a walk in is 25 to 60 inches, and a height of 40 inches. Pricing: Aside from assessing your needs and bathroom size, affordability is a key factor. As this could potentially be a big job, getting quotes from contractors is imperative. Aside from installation of the new tub, the old tub will need to be removed. Tub prices begin at $2,000 and go up from there, not including installation. Timeframe: Is the need for a walk in tub immediate? How long will demo/installation take? What, if any, are the bathroom alternatives during construction? Doors: Walk in bathtubs are tubs that have doors installed on them, allowing the user to step into the tub rather than climb over the edge, due to the low threshold. Sealants: Heavy sealing around the edges and door to prevent leakage, making the door watertight. Seating: Molded seating grants users the ability to enjoy bathing in a comfortable seated position instead of standing for a long period of time. Depth: Walk in tubs are twice as deep as traditional bathtubs, more akin to a hot tub. Combined with the seating, those with limited mobility have an easier time getting in and out, and do not need to lie down. Treads: Anti-slip treads are essential in preventing falls. Grab bars/Handrails: The tubs can have bars or handrails giving seniors balance. Safety drains: Water drains faster to avoid standing in still water for long periods of time. Levers: Faucets typically have levers in lieu of knobs, as levers are easier for people suffering from arthritis to turn on and off. Extended shower heads: Some styles of walk in tubs have extendable shower heads which can come in handy when there are other family members in the home needing to use the bathroom. Other specialized features include anti-scald systems to prevent accidental burning and self cleaning mechanisms to prevent mold and bacteria. Some tubs also offer massage features, such as water jets, which are soothing to tired muscles and joints. As is the case with other major appliances, there are a variety of walk in tub styles on the market, ranging from the very basic to all the bells and whistles. Keep in mind the more features, the higher priced tubs are, on top of the installation fees. Some tubs have features that will serve a person’s needs better than others, and in some cases, better serve in the long term. Soaker Tub: this is the most basic walk in tub. It is less expensive than other tubs, and has no water jets, but can include the most basic necessities – the grab bar, handheld shower accessory, and leak proof sealants. Wheelchair Accessible: This style is not only beneficial to those in wheelchairs, but also those who need to move more easily to a seated position. Bariatric: These tubs are similar to wheelchair accessible tubs and can accommodate individuals heavier than 300 pounds. Air Jet Tub: Air jets gently move water in the tub providing a gentle massage. Due to the jets, there is a cleaning feature to prevent bacteria build up in the system. Hydrotherapy Jet Tub: Water jets, like a whirlpool tub, provide a more vigorous massage than air jets. The pressure from these jets relieves joint pain and improves circulation. Aromatherapy Tub: A tub that mixes essential oils in the water to create a relaxing spa like experience. Chromotherapy Tub: Chromotherapy uses colored lighting to provide a relaxed atmosphere. Combination Tubs: Most tubs do not have a singular feature and have a combination of features. In addition to providing a safer place to bathe, a walk in tub can provide comfort, therapeutic benefits, and peace of mind not only for yourself, but for your family. Anyone who has struggled in a traditional tub due to aging or ill health will no longer have to deal with a slippery rub floor or prolonged standing. Disease sufferers: walk in tubs have benefits for a number of conditions, including arthritis, heart problems, diabetes, even Alzheimer’s. Arthritis: regular warm baths allowed for less pain and stiffness, as the water relieve pressure from joints, dilates blood tissue, and improves circulation. Diabetics: the New England Journal of Medicine reported that 13% of people with Type 2 diabetes had a reduction in blood sugar levels, improved sleep, and an improved general sense of well being due to warm water baths. Alzheimer’s: As one of the most debilitating diseases today, Alzheimer patients with walk in tubs are more at ease during bathing. Being able to sit instead of standing offers some measure of control and safety without fear of falling. Owning a walk in tub also provides an easier way for a caregiver to bathe a patient that a shower or traditional tub can not. Heart Health: Soaking in a tub will improve a person’s heart rate while lowering their blood pressure at the same time. This is the same cardiovascular benefits and heart strengthening that cardio exercising provides; something that elderly or infirm may not be able to accomplish. Sleep Disorders/ Sleep Apnea: Some people take mood altering medication – prescribed or over the counter- to help get a good rest at night. While bathing may not provide that same end result, it can relax a person and get their body ready for sleep. Warning: According to a report by the agency, 4,866 people drowned to death in a bathtub at households in 2014, up from 2,870 in 2004. Especially in combination with certain medication this can be dangerous. Stress Reduction: A walk in tub is a wonderful way to rest after a long day. Warm baths have been noted to improve metabolism and strengthen the immune system. A tub with jet capabilities with further enhance a spa like experience with gentle massage – also called hydrotherapy. 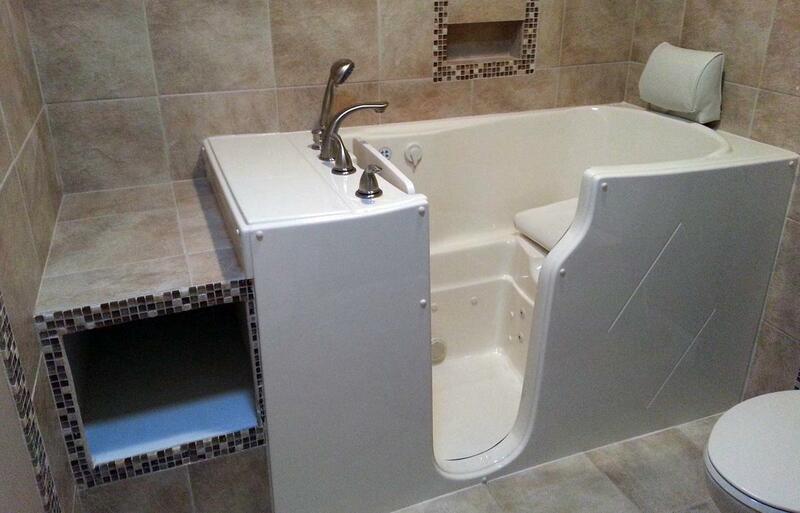 Convenience: For those with limited mobility having a walk in tub they can simply open the door, and sits down. There is no struggle to step over a tub edge and potentially slip and fall. “Aging in Place”: With the costs of healthcare and assisted living facilities rising all the time, seniors are electing to stay in their own homes longer than ever. Installing a walk in tub allows for this possibility and makes it easier. Hygiene: Taking a bath is easier than a shower and can be done at a more leisurely pace. Sitting is more convenient to clean hard to reach places when there is limited mobility. Having a tub makes it easy to maintain a regular bathing routine and keep hygiene in check. Water Usage: Water usage actually decreases using a walk in tub. Walk ins generally hold 50 gallons, while standard tubs can hold anywhere from 42-80. Independence: It’s frustrating to be unable to do normal everyday things that once came easily when there are safety concerns involved. A walk in tub will give a user independence and not be reliant on anyone else or sacrifice their own wellbeing. While the benefits of having a walk in tub far outweigh the cons, there are a few that must be attended to. The Door: Before turning on the water, the tub door must be firmly shut. This can be an issue for someone with strength problems. Depth: Due to the deepness of the tub – typically up to 4 ft – it takes awhile for it to fill up. Drainage: The tub must be completely drained before exiting. Most walk in tubs have specialized rapid drains for this very purpose, but the tub still must be empty prior to opening the door again, in addition to prevent any possibility of flooding. Water Heater/ Temperature: As stated previously, a walk in tub needs more water than a regular tub, more than a person’s current water heater could be able to handle. Having to put in a new water heater would be an added expense to what is already a already pricey endeavor. Affordability: Again, while installing a walk in tub costs less than hospital stays after injuries or assisted living, it is still a major project that will run several thousand dollars. While it can be viewed as a long term investment and has many benefits, it is not a decision to be taken lightly or a simple one. It can require serious budgeting, saving, and planning. $5,000 to $7,000. The standard tub alone is estimated around $2,000 to $5,000. Specialized tubs – those with air jets, hydrotherapy, bariatric or a combination feature tub – are as high as $5,000 to $10,000. Medicare doesn’t cover any costs regarding walk in tubs, as they are not considered medical equipment, but some states may offer assistance under Medicaid. Unless the tub can be installed yourself, the budget for installation needs to include professional construction work. It’s best to call around and get recommendations and then estimates to find the best price. Some walk in tub installations may require new water heaters and electrical work, in which case calls to plumbers and electricians are needed as well. In addition to the these costs, what also must be examined is maintenance costs, and any long term effects the tub will have on home utilities. A bigger tub will use more water and more heat, increasing monthly bills.